In the world of competitive archery, small details are important. These details may range from getting your arrow’s dynamic spine perfect for optimal flight to printing out an accurate sight tape. What can we use to assist us in this quest? Well, the old “get it in the ballpark” technology of arrow charts has been outdated for sometime so instead, today’s serious archer relies on archery software. 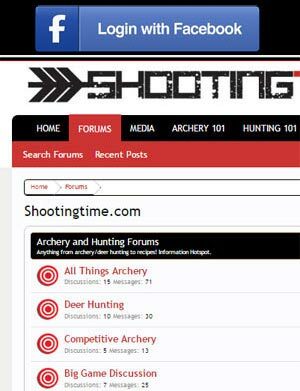 Which archery software is the best? There are a couple available and they all have their strong points, but in today’s review we are going to take a look at one that is fully functional both on a desktop computer as well as your smartphone. Let’s take a close look at Archers Advantage. Archers Advantage offers a wide variety of features that cover about every need of a competitive archer. Shaft Selector – The shaft selector will allow you to enter your equipment’s specs and see what arrow delivers the best dynamic spine. This takes the guesswork out of arrow building and should get you very close to the perfect arrow for your rig. Sight Tapes – Enter your sight type specs, the distance from your peep to your sight, and the peep height from your arrow. Next you are going to enter actual tape data from 2 shots. For a field archer, you can enter the distance between a 20 yard mark and an 80 yard shot mark on your sight tape. This information will help the software populate a super accurate printable sight tape for all distances. Ballistic data – On the “Preview Marks” tab, you’ll be able to see data such as initial speed, terminal speed, total drop, and more at any distance you want to enter. Scaled Targets – Want to simulate how a 20 yard vegas face target would look at 15 feet? No problem. 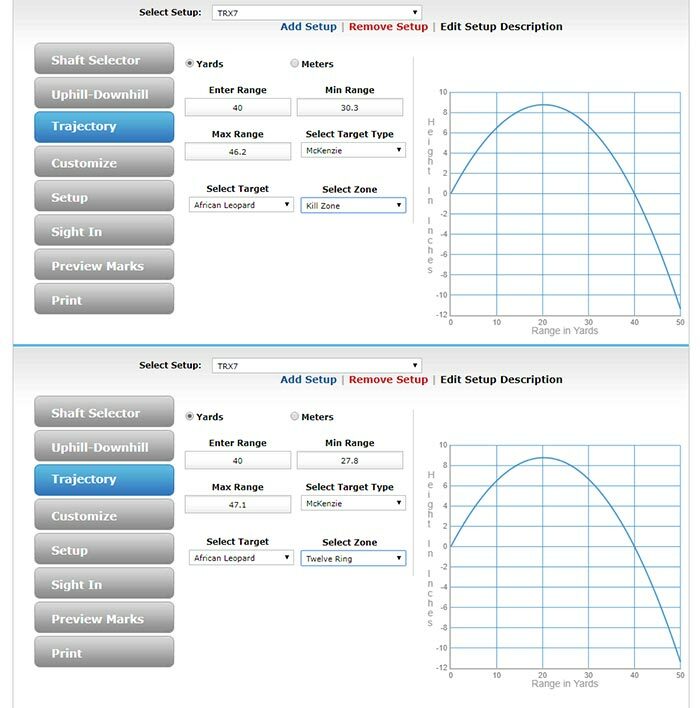 Just enter your desired data and you’ll be able to print out an accurate replication of how that target would look at the shorter distance. This is extremely handy when you are limited on space but want to hone in your aim and shot execution. Uphill/Downhill data – This calculator will allow you to see exactly how far off the mark your arrow will impact when shooting at uphill and downhill angles. It will also give you the actual adjusted range or horizontal distance to the target. Trajectory – Archers Advantage will show you how far you can be off with yardage while still hitting your targeted area. 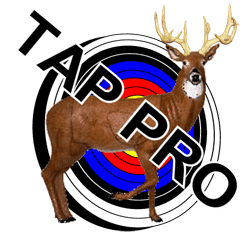 Simply choose from a variety of targets ranging from paper face targets to all the major 3D animals available. Next, select the targeted part of the target: X ring, 12 spot, etc. The program will show you the yardage range that still will allow you to hit your mark. For example, for an African Blesbok at 40 yards, the program is telling us that if we shoot it for 36.8 – 42.7 yards, we will still be in the 10 ring. The Archers Advantage program is actually pretty simple to use. 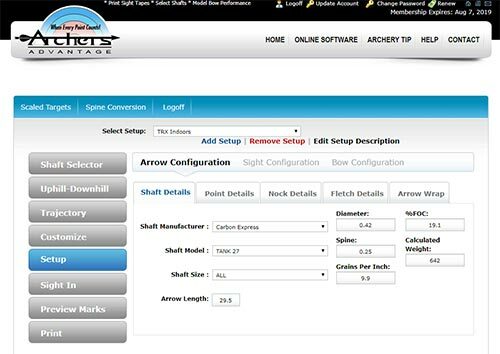 Simply log in to https://www.archersadvantageonline.com and begin customizing your setup. You can create as many setups as you’d like. I have setups for indoor spots (23/64 and 27/64 arrows), 3D, field archery, and hunting. Once you create a setup and make a change, the program will autosave on the fly. This is extremely useful because regardless if you’re on your phone or your desktop, the setup you choose will always be the latest, updated version that you have created. My favorite feature of this program is the shaft selector. When buying arrows, you definitely want to select the right shaft. By adjusting arrow components in the program, you’ll be able to dial in the perfect dynamic spine. It’s nice knowing exactly what length shaft, tip weight and spine will result in the dynamic spine your equipment calls for. From our experiences, the program has been pretty accurate with its suggestions. 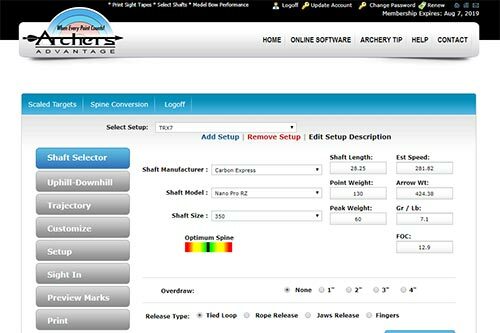 Have a look as we finalize choose an arrow for our setup and go over some other nice features of Archers Advantage. Another great feature from Archers Advantage is the ability to print a sight tape. Simply input your sight data including real time measurements at full draw and then complete a couple of registration shots. After you take the two shots and measure the sight tape gap between the marks, Archers Advantage will generate a very accurate sight tape for your sight. For a look at other features, please watch the video above. Archers Advantage is a nice program to have. The fact that you can use it on your mobile device is probably one of its best selling points. The available equipment database is plentiful and allows for easy creation of setups. Even though it normally performs extremely well, we did find some glitches that we hope get fixed. With the trajectory feature, we were confused by contradictory information with some targets. Click here to view a screenshot. Also, we noticed that for some reason, the IBO speed of our bow, which should be a fixed number, has changed during certain setups. Aside of those couple small glitches, we think that Archers Advantage is a program worth having. As long as you have your smartphone with you, you’ll be able to use the program. Archers Advantage is extremely accurate and is trusted by some of the world’s top archers. For more information on Archers Advantage, visit their website at https://www.archersadvantageonline.com/. Archers Advantage is a great program that can be used at home on a desktop or at the range on your mobile device. If you’re in the market for an archery program, we suggest giving it a try.